Waterbirds are water-dependent, nonpasserine species which are not waterfowl or shorebirds. They are the long-legged wading birds, secretive marshbirds, and seabirds. They include the orders Gaviiformes (loons), Podicipediformes (grebes), Phoenicopteriformes (flamingo), Procellariiformes (shearwaters), Pelecaniformes (boobies, gannet, pelicans, cormorants, anhinga, and frigatebirds), Ciconiiformes (bitterns, herons, egrets, night-herons, ibises, spoonbill, jabiru, and stork), Gruiformes (rails, gallinule, moorhen, coot, and cranes), and the Charadriiformes of the families Laridae (gulls and terns), Stercorariidae (skua and jaegers), and Alcidae (guillemot and murrelets). Many of these species are long-lived, produce few young each year, have high juvenile mortality, and delayed sexual maturity. Several species make spectacular annual long distance migrations between breeding and wintering areas. How many waterbirds are there? World-wide there are over 600 species of waterbirds. Approximately 130 species are commonly found in North America. At least 90 species have been documented in the Great Plains region. The Great Plains is the largest ecosystem in North America and covers an area nearly 2,500 miles long and 600 miles across at the widest point. What challenges do waterbirds face? Dependence on water during part of their life renders waterbirds vulnerable to challenges associated with management and conservation of aquatic habitats. Wetlands, lakes, streams, reservoirs, estuaries and open pelagic waters face unique threats including habitat destruction, pollution and natural events such as storms. As many species are colonial, large numbers of individuals can be affected by a single event. Abandonment is likely when people enter nesting colonies during the nesting stage and predators will take unprotected eggs and young. Several species with robust populations are legally harvested in parts of their range. Still others are considered to be in direct competition with human interests and are legally taken under depredation orders and permits. Though synonymous with being crazy, the common loon is a smart and interesting aquatic bird. 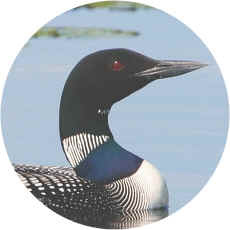 The loon is also known for being extremely awkward. Its legs are placed far back on its body which makes it a powerful swimmer. This arrangement, however, doesn't help when on land. Loons are rather clumsy when on their own two feet. Great Plains Waterbirds are found below. Species accounts and scientific names are in taxonomic order and follow the 7th edition (1998) of The A.O.U. [American Ornithologists’ Union] Checklist of North American Birds and its supplements (42-50). Name changes and reordering occur regularly as biologists learn more about species and how they are related. The Shoreline highlights key characteristics of the most visible and common species found in the Great Plains. Brief descriptions of rare species, known to occur in small numbers or found only in localized sites within the region, are also given. Accidental species, those which have been seen in the region but not on any regular or predictable basis, are listed. Four species of loons (or divers) are reported from the Great Plains. Loons are highly adapted to water and spend most of their time on large bodies of water like reservoirs, lakes and rivers. They catch their prey, primarily fish, by diving using their webbed feet and occasionally their wings for propulsion. Loons need clear water to find their prey. Feeding studies show it takes over a ton of fish to fledge a brood of chicks. Loons have long bodies and their legs are set far back making them clumsy on land. Although strong fliers, they need “running” room across the water surface to become airborne. Several Native American tribes link loons to the creation of the world and see them as symbols of pride and bravery. Loons begin breeding between 2 and 6 years of age, depending on the species and are not likely to breed every year. They are site faithful, territorial and monogamous. They generally build nests on small islands or along the edges of shorelines of freshwater lakes. Both parents incubate the 1-2 eggs, beginning with the first egg laid. Young can swim soon after hatching, but are often seen resting on their parents’ back until they are about 2 weeks old. Chicks fledge in 7-11 weeks, but may still be fed by the parents even after they leave the breeding area. During migration, loons travel as single birds or in small, loose flocks, usually at night. Most loons winter in larger groups in coastal marine environments. Loons are highly susceptible to disturbance from development and recreation. Mercury and lead contamination are also major threats to loons. Oil spills can kill wintering loons or destroy their food supplies. Wintering loons are sometimes entangled in ocean fishing nets and drown. Grebes are adapted to an aquatic lifestyle. They sit low in the water, have streamlined bodies and short, hidden downy tail feathers. Their legs are set far back on their bodies giving them great propulsion, but making them clumsy on land. They can sit or swim with just their head above water and they have waterproof plumage. Pectoral muscles are poorly developed in grebes and there are several flightless species worldwide. Grebes run along the surface of the water while rapidly beating their wings to take off. It is suspected most grebes simultaneously molt all their flight feathers at the end of the breeding season or prior to completing their southbound migration. They may be completely flightless for a period of 3-4 weeks. During the breeding season, grebes are found on lakes, reservoirs and wetlands. Migration usually takes place at night and flocks can be quite large. Migrating grebes use a variety of wetlands. They winter along coasts and on inland lakes. Grebes have highly ritualized courtship displays. Partially floating nests with easy access to water are constructed from aquatic vegetation by the breeding pair. Both sexes incubate the eggs. After the eggs hatch, adults leave the nests and carry the chicks on their backs in pockets formed by the wing and back feathers. Although the floating nest reduces the predation risk from many mammalian species, gulls, crows, harriers, coots, turtles and large fish are known to take eggs and chicks. Introduced exotic fish also compete with grebes for food, prey on young chicks and alter aquatic vegetation. Grebes face many other challenges, including entanglement in fishing nets and habitat degradation through oil spills, pollution and destruction of nesting vegetation. The order Pelecaniformes includes several species of tropicbirds, gannets, boobies and frigatebirds, as well as the species of pelicans, cormorants and Anhinga commonly found in the Great Plains. All of these are adapted to fishing. Long necks and long, conical bills are used to quickly strike and catch fish. 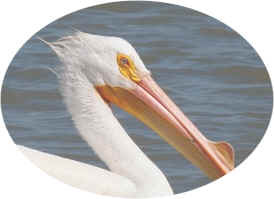 Pelicans use their large, bare, extendible gular pouches, which can hold over 3.5 gallons of water, to scoop up fish. Although their tongues are small, it is the tongue muscles that control the pouch and allow pelicans to expel the water after they make a catch. All of the birds in this group have excellent propulsion through water due to large, webbed feet and short, sturdy legs set far back on their bodies. Hollow bones and air sacs make them buoyant in the water. The micro-structure of the feathers of darters and cormorants allows the feathers to become wet and reduces their buoyancy making diving easier. The trade-off is they need to spend considerable time perched with their wings spread to dry in the sun. Birds in this group are long-lived and have delayed sexual maturity. They lay few eggs each year and usually only a few chicks per nest survive. Since many are colonial nesters, factors that affect a colony can have impacts on local and even regional populations. Outbreaks of diseases such as Newcastle’s Disease and West Nile Virus can kill entire colonies. Many species are sensitive to human disturbance and mammalian predators during breeding and will often abandon their nesting colonies if disturbed. As fish eaters, they are exposed to large quantities of heavy metals and contaminant bioaccumulation. Eliminating the use of DDT in the U.S. and Canada allowed pelican and cormorant populations to recover. Although most species of fish taken by this group of birds have little or no commercial or recreational value, human perception of them as competitors often causes conflict and persecution. Aquaculture facilities are attractive to these birds because of the relatively easy feeding opportunities they provide, often resulting in conflicts. Several cultures have historically depended on this group for a variety of purposes. Cormorants and darters have been kept as working pets to catch fish for their owners. Feathers from several species were used in the millinery trade. Eggs, chicks and adults have been taken for human consumption. Guano from nesting colonies provides fertilizer. Several species play key roles in maritime lore, medieval art and Asian medicine. Frigatebird chicks were hand raised and used as message carriers by early sailors. vegetation. Bitterns are cryptic, solitary and usually nest in thicker aquatic vegetation. Clutch size varies from 2-7 eggs depending on the species and young hatch helpless, mostly unfeathered and with their eyes closed. Several species grow ornamental plumes on the head, lower neck, breast and back during the breeding season. These plumes, once used to adorn fashionable hats, were highly valued by the milliner’s trade. The overharvest of birds through the early 1900s resulted in the near extermination of several species. World-wide they have also been harvested for food and killed because they are fish-eaters and seen as competitors with humans. Habitat loss and pollutants are the biggest problems facing this group of birds. The order Gruiformes has species representing both the smallest and largest waterbirds found in the Great Plains. These species inhabit marshy wetlands, are highly territorial and are solitary breeders. Several species have developed intricate courtship behaviors. Due to their longevity, monogamous habits and extended care of young, cranes, the largest species in this order, have long been viewed as symbols of good luck, long life, peace and marital bliss. Cranes have developed several elaborate displays and vocalizations which can include leaping, dancing and calling. “Thin as a rail” describes the laterally compressed bodies of all rails. Flexible vertebrae allow them to effortlessly squeeze through dense marsh vegetation. Long toes, strong legs and vestigial claws at the tips of the wings assist them in navigating floating vegetation and climbing stems of emergent vegetation. Rails are also able to swim to elude predators and are not strong or graceful fliers. 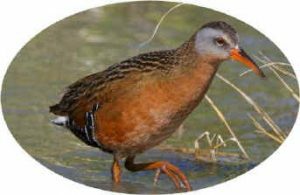 Most species of rails build nests on the ground or in vegetation above water level. Many nests are covered with a dome canopy thought to be built for concealment. Chicks can leave the nest within days, but depend on the parents to feed and brood them. Rails are often killed when they collide with objects, including lighted towers, overhead wires, buildings and vehicles. As with most species of waterbirds, wetland habitat degradation and destruction are their biggest threats. Vocalizations are distinctive and often the only way small secretive species like rails can be reliably surveyed. Good recordings are readily available for species found in the Great Plains. Learning the calls can provide clues to bird presence and the use of playback calls may allow individuals to be coaxed into view. However, be aware birds are reacting to perceived threats. Overuse of calls to lure birds during the breeding season means time spent away from nesting and foraging, which is detrimental to breeding success. 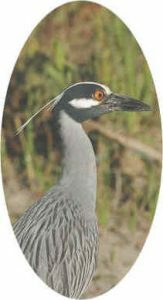 Gruiformes is the only waterbird order in which several species are legally harvested within parts of the Great Plains. Crane and rail hunting is a specialized sport – to the point of developing its own culture among die-hard aficionados. Care is taken to delineate hunting areas, bag limits and season lengths sustainable for each hunted species. Understanding the biology and habitat needs of each species is important and researchers work with land managers to maintain high quality wintering and breeding habitat to ensure robust populations. Legal species, season dates and bag limits vary among states and years, so hunters should consult current regulations. This large suborder of seabirds is most closely related to shorebirds. Several species have a worldwide distribution. Viewing areas for gulls and terns within the Great Plains include wetlands, reservoirs, sand bars in rivers and garbage dumps. Because they are powerful fliers, prefer open spaces and congregate in groups around food resources, most people are aware of gulls. 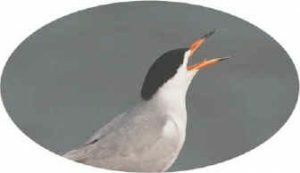 Terns are generally smaller and more slender than gulls and are primarily fish eaters. They can be easily distinguished from gulls by their hunting technique. Gulls pick things off the surface of the water or land, whereas terns dive after their prey in open water. Jaegers are primarily oceanic, usually only coming inland to breed. At sea they steal food from other seabirds and on land they are predators feeding on lemmings, small birds and other animals. Correctly identifying different gulls takes practice and careful observation. Individual bird identification can be challenging as gulls look different depending on age, feather wear, individual variations and the tendency of some gulls to hybridize. Size, leg and bill color and patterns on wings and tail are important for identification. Only the most general identification characteristics are offered here. It is recommended that you take time to make careful observations and take extensive notes on species you are unsure of. Because of the subtle differences and the low likelihood of encounters, similar species, which we have classified as rare in the Great Plains region, are not differentiated here. A specialized gull identification guide, showing standing birds and the wings and tails of flying birds, in both winter and breeding plumage and the different age classes, is highly recommended as a study aid for gulls, terns and jaegers. However, even with an excellent resource, some gulls and jaegers may not be identified to species in the field. These species are not regularly encountered every year or are known to occur only in small numbers in localized sites within the Great Plains. Many common waterbirds can be misidentified as a rare species. Sightings of suspected rare and accidental species should be confirmed using a more detailed text and carefully documented with photographs and detailed descriptions. The following birds are considered Accidental within the Great Plains. Only a single or a few scattered records exist for each of these species. They are out of their normal range when found here.